Whyte’s aluminium hardtails have always been a fine blend of fun, control and speed and this year’s 801 is no exception. For 2018 it has been completely overhauled, gaining a new longer frame, wider handlebars, a shorter stem and wider grippier tyres. The result of this is a bike that handles superbly and corners like a dream. And, the upgrade to a dedicated single chainring frame has also allowed engineers to reduce the length of the chainstays for improved agility and a more dynamic ride. 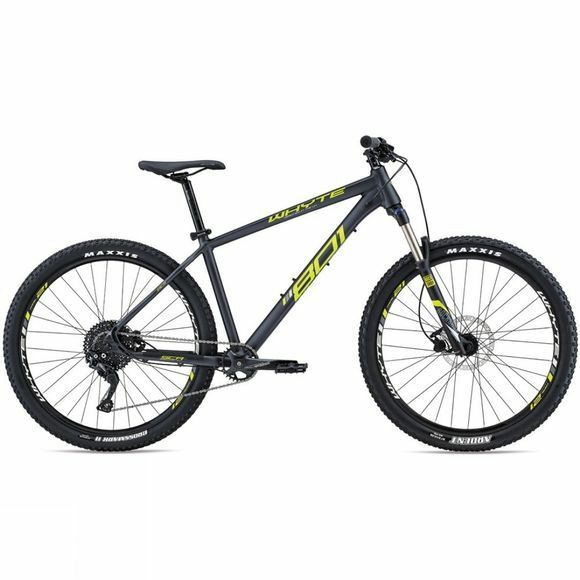 The 801 is fitted with a RockShox 120mm 30 Silver fork for trail-bike levels of performance, and paired with Shimanos Deore gearing, this years model is more than capable of taking you up and down those undulating trails. This impressive hardtail is finished off perfectly with Whyte’s clever UK design features that help tame our less than desirable climate. Their Get A Grip seatpost clamp system is not only weatherproof, with seals around the post and the frame to help prevent any mud or water damage, but also features an ergonomic lever that makes adjusting seat post height super easy even with the coldest of hands!